Taormina is getting ready to host another event organised by the association Taormine, after the beautiful Food and Flower weekend, Food and Jazz Day will entertain Taormina’s tourism on the 30th of April. An event where Food and Jazz will mix together inspiring Chefs and Bartenders to create unique dishes and cocktail. Influenced by syncopation and rhythm of the music played, by different groups from all over Sicily, in all the main squares of Taormina to entertain you during your visit in Taormina. Many Chefs and Bartenders have created for this event their own recipes, getting also inspired by people who made the history of Jazz, with creativity and passion in order to let you taste delicious Sicilian ingredients mixed up in a Jazz theme. 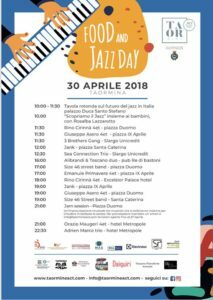 Food and Jazz Day will start at 10.00 am with a special appointment: Future of Jazz in Italy will be discussed at the gorgeous location of “Palazzo Duchi di Santo Stefano”, also at 10.00 am a moment dedicated to children in order to let them discover Jazz, with Rosalba Lazzarotto. 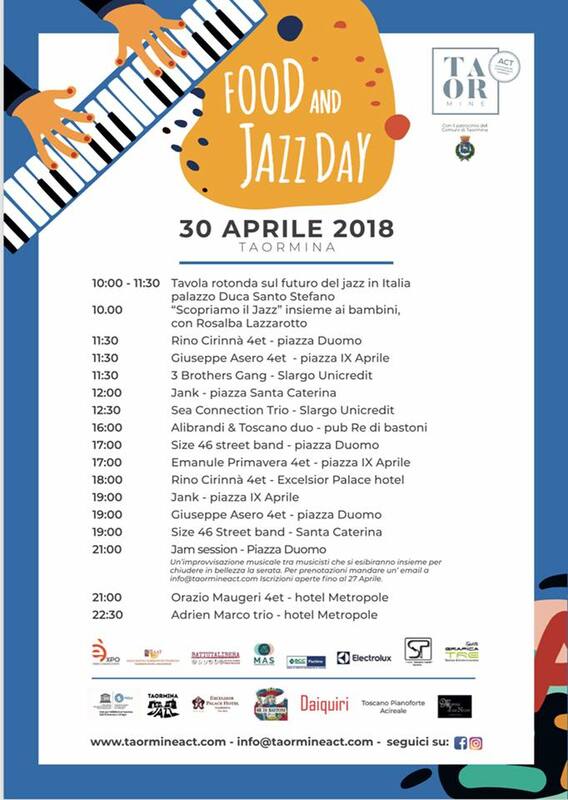 These are some of the groups that will play during the Food and Jazz day: Rino Cirinnà 4et, Giuseppe Asero 4et, 3 Brothers Gang, Jank, Sea Connection Trio, Alibrandi & Toscano duo, Size 46 street band, Emanuele Privitera 4et, Orazio Maugeri 4et, Adrien Marco 4et.